“The Little Black Dress is not just a fashion accessory. It's an institution - an iconic fashion symbol." My summer has been rife with thigh-skimming sundresses, and eyelet-adorned frocks; but with the arrival of fall, I’m re-embracing my one true love…the little black dress. Take a peek at some of my favorites! Lovely lace and a scalloped hemline add a double dose of decadence to the classic style. Sequins, mesh…hello perfect Girls Night Out little black dress! Sheer, banded bell sleeves and a shift aesthetic give a whimsical, Wendy Darling feel to this black beauty! The high neckline is le parfait contrast to the hi-low hemline; while the sleeveless cut allows you to sassily show off your shoulders. Satin siding creates an on-trend slimming illusion that is too pretty to resist! Which little black dress is your favorite? Thanks to Next.co.uk for the pictures. FTC Disclosure: This post was written in partnership with Next. All opinions expressed therein are my own. 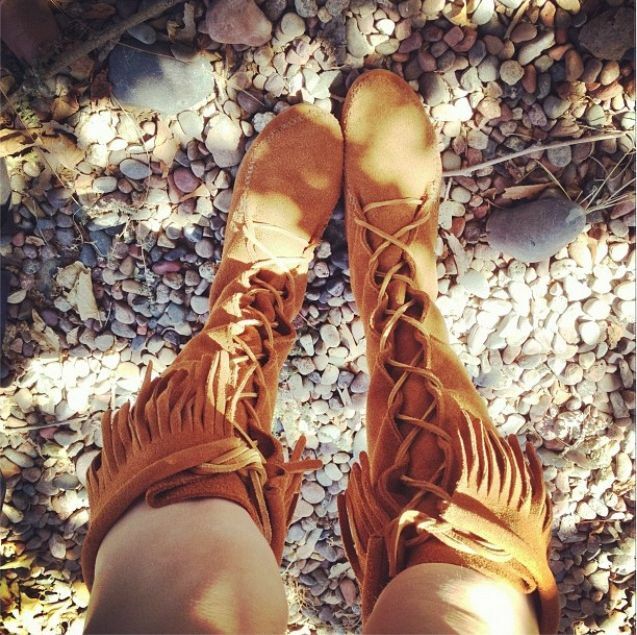 In honor of the weekend, and the arrival of boot season (finally!) I thought I would introduce you to one of my latest footwear besties…the Minnetonka Lace Up Knee High Boots in Brown (not to be confused with the darker ‘Minnetonka Brown’ color); which I have taken to referring to as my Pocahontas boots, and have scarcely taken off since purchasing them two weeks ago. Five Words: Supremely comfortable. Super cute. Obsessed! What are you wearing for #FashionFriday? Follow me on Instagram @cafefashionista to check out more of my #FashionFriday / In My Closet looks. This fall kiss super dark eye makeup goodbye, and go for a runway-inspired subtle smoky eye created with earthy brown hues that look luscious on any and all complexions! 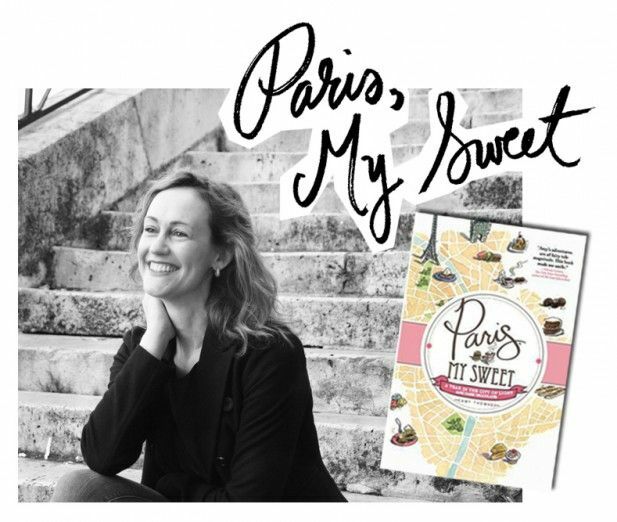 'Paris, My Sweet' Book Giveaway! I have had a long distance love affair with Paris for more time than I can remember; but recently, it has grown even stronger due to Amy Thomas’ intoxicating and oh-so delectable Paris, My Sweet: A Year in the City of Light (and Dark Chocolate) - a magically delicious literary journey for the Eloise-loving girl who has a taste for international adventure and sweet treats. And now, thanks to Sourcebooks, I am sharing the Parisian journey with you! That’s right, mon doux! Café Fashionista has teamed up with Sourcebooks to bring two (2) lucky ducks copies of Paris, My Sweet: A Year in the City of Light (and Dark Chocolate) (a tome which I have taken to toting about in my handbag) – and more than 30 methods of entry to win! This Giveaway is open to U.S. Readers Only; and/or Those With U.S. Shipping Addresses. Thanks to The Chalkboard for the picture. Today, instead of featuring just one nail color, I am featuring four – all of which are a part of OPI’s So So Skullicious Halloween 2012 Mini Set, which is actually a Day of the Dead (Día de los Muertos) Collection (that comes packaged in the cutest box ever, and includes Day of the Dead-inspired nail decals – you can see pictures of the packaging/decals at the end of this post). Swatch time! This is two coats of A-Rose from the Dead, which is a really pretty bright pink. OPI states: This hot pink is the life of the party. The formula on this shade was perfection – super easy to work with. Unfortunately, I had a wonky brush that was somewhat uncooperative; but overall this one was awesome. Accessories: Forever 21 Cutout Heart Ring Set in Gold. This is four coats of Candlelight, which I would describe as egg yolk yellow. 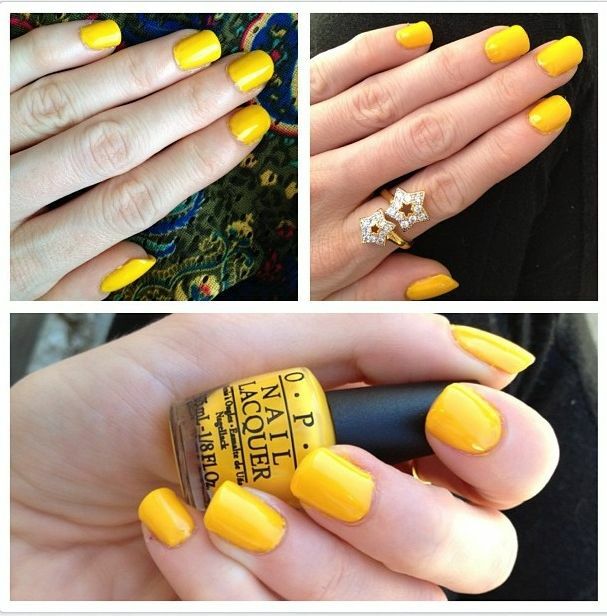 OPI states: Be all aglow in this flame yellow. The formula was really thin on this shade, and required four coats for full opacity. That said; this is my favorite color from the collection. I absolutely love the shade, which is a fall-leaning yellow that has a bohemian ambiance to it (I think it would look gorgeous paired with paisley), as opposed to a bright, summery yellow. I would buy a full-sized bottle of this color. Accessories: Star Ring via unknown. This is two coats of Hi, Pumpkin!, which is a bright orange crème. 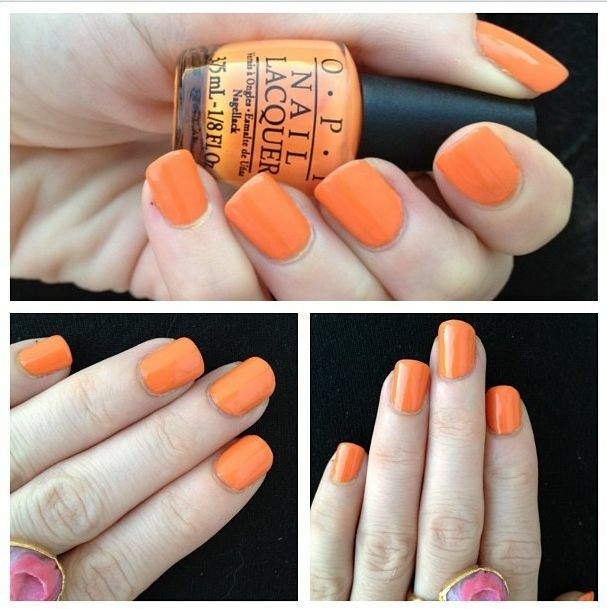 OPI states: This jack-o-lantern orange is sweet on you. Application-wise, this was my favorite out of the entire collection – the brush and formula were both perfect here. Hi, Pumpkin! screams fall to me – I kind of wanted to run out and grab a Pumpkin Spice Latte from Starbucks when I was wearing this. Not necessarily unique, but very pretty…and how cute is that name?! Accessories: Dara Ettinger Angelica Ring last seen here. This is two coats of Mourning Glory, which is a brooding black crème. 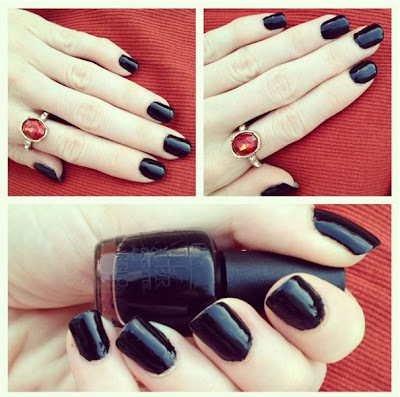 OPI states: A black is so shiny, it will lift your spirits. I found that the super small brush made using a black polish daunting, as it was so simple to make mistakes. If it weren’t for the brush, this would have been a one coater for me. Nevertheless, I do love how impossibly chic this color is. It makes me think of Kristen Stewart, vampires, and Twilight - so perfect for Halloween! Accessories: Forever 21 Burnished Oval Ring in Red / Gold. And the pièce de résistance…the packaging! The bright colors are so incredibly adorable; and I just love the sugar skull. I didn’t try the nail decals myself; but I think they would look so fantastic as an accent nail. 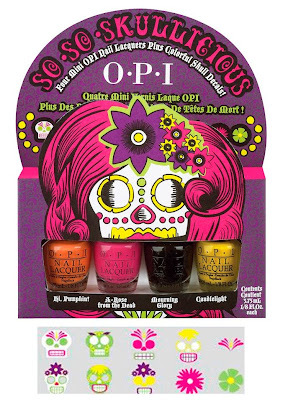 What do you think of OPI's So So Skullicious Halloween 2012 Mini Set Collection? 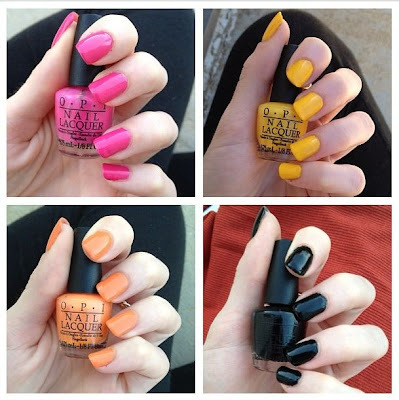 What nail color are you rocking for #ManicureMonday? FTC Disclosure: The OPI So So Skullicious Halloween 2012 Mini Set Collection was sent to me for review; however, all opinions expressed therein are my own. I rarely use anything but Neutrogena products, because I have super sensitive skin; however, when I won a trio of products from the Dermalogica Age Smart Collection (thanks SkinCareRX! ), I thought I would give them a try as they sounded perfect for staving off dry skin, and rehydrating / revitalizing. From my personal experience, these products have done all of the above; and have become some of my new favorites. 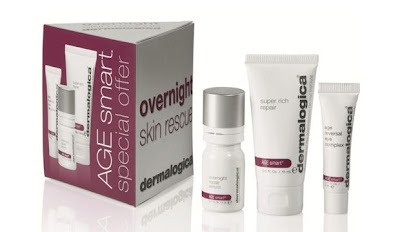 ♥Age Smart Overnight Repair Serum This is my favorite product of the three – and the one that I will continue purchasing in the future. At night, right after I cleanse my face, I use about 5 drops of this (pressing it into the skin on my face with my ring finger), and then apply moisturizer; and I wake up to beautiful results. I have been using it for a week, and find that it feels incredibly soothing once applied, and is really great for sensitive and/or dry skin. From the first time I used this product, my skin had a more radiant glow to it (and who doesn’t love waking up to a beautiful glow in the morning?!). $60.00. ♥Age Smart Super Rich Repair This is like age reversal in a bottle (even if you, like me, are still in the early twenties category). I found that with a week’s worth of uses of this product, fine laugh lines greatly diminished, and my skin-tone looked brighter and refreshed. This one is great at rehydrating super dry skin – on both the face and hands. NOTE: If you mix in a few drops of the Overnight Repair Serum (mentioned above) you can cut down on an extra nighttime beauty step, and still achieve the same results. $78.00. ♥Age Smart Age Reversal Eye Complex I absolutely love the way this feels on my skin. I’ve only been using it for a week, so I am at the use-every-other-day step; but it is such a refreshing way to start the day. I pat it (using my ring finger) from the outer corner to the inner corner underneath my eye, and have found that it definitely minimizes fine lines, as my undereye concealer has been less likely to crease throughout the day since I began use. My favorite part…it’s non-greasy. The tube is small, but very little is required with each use, so you can see that it will last for awhile. Highly recommended! $78.00. Do you use anti-aging moisturizing products? Would you try any of these Dermalogica offerings out yourself? Thanks to Joyce Marie of Beverly Hills for the picture. FTC Disclosure: These products were sent to me for review, as part of a SkinCareRX giveaway; however, all opinions expressed therein are my own. You all know me for my love of nail polish and shoes; but one thing I refuse to ever leave the house not wearing is earrings. There is something about a great pair of earrings that awakens your entire face and makes your eyes sparkle. 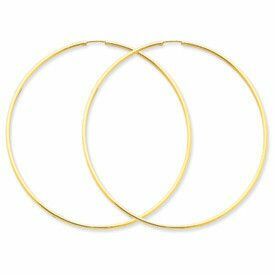 Though I myself usually opt for a pair of oversize diamond studs for their practicality and sophistication; I have an absolute obsession (that developed during my I-want-to-be-Kelly-Kapowski-from-Saved-by-the-Bell years) with huge hoop earrings. 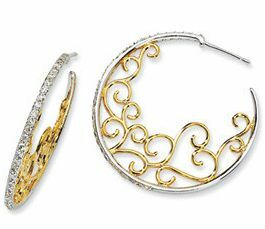 Thus the reason why I spend countless hours each day perusing the pages of LooptyHoops, which features a ton of gorgeous earring selections; and one of my absolute favorite features…a sizing guide! Check out my current earring crushes below! Large and in-charge! I'd pair these with an off-the-shoulder top and playful pony for a daytime outing with my besties! The subtle pale blue, rose pink, gold, and sage green shades are the perfect way to bring out the color of your eyes; while the twisted oval shape is an unexpected touch. I'd pair them with a safari-inspired ensemble! A hoop style that Marie Antoinette would undoubtedly approve of. The scrolling reminds me of Versailles - tres glamorous! And the blend of sterling silver and gold? The ultimate in versatility! Pair these with a messy updo and you'll be dripping sophistication! One part glamour. One part edgy rebellion. These are my pick for the perfect Girls Night Out! 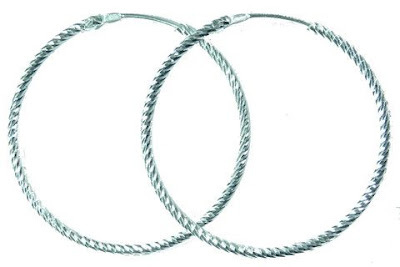 Which pair of LooptyHoops are you coveting? Stay tuned for the chance to take your own pair of LooptyHoops home right here on Café Fashionista – Giveaway to come soon! Thanks to LooptyHoops for the picture. FTC Disclosure: This post was written in partnership with LooptyHoops. All opinions expressed therein are my own. Leave a splash of sparkle in your wake with a fall-perfect bootie bedazzled with glitter! 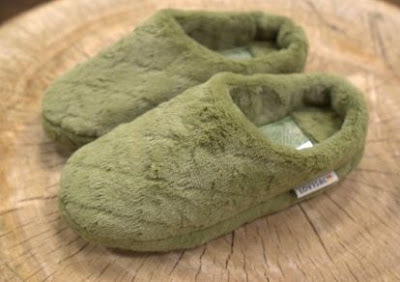 Slip Into the LoveSac Slipper Giveaway! Boots are my besties when it comes to braving the semi-cold Southern California fall and winter weather; but when I’m at home with hot cocoa in one hand and a mystery novel in the other, there’s nothing I love more than a fabulous pair of comfy slippers – which is exactly what one (1) of you ladies will soon be taking home! Surprise, surprise, lovers! Café Fashionista has teamed up with LoveSac (the ultimate in cozy goodness, mais oui?) to bring one (1) super chic reader a pair of LoveSac Green Phur Slippers (which are the perfect sage green hue for fall – and truly one of the coziest things you can slip your feet into when you’re feeling chilly), and more than 40 methods of entry to win! Thanks to LoveSac for the pictures. This is two coats of China Glaze’s Traffic Jam from the Fall 2011 Metro Collection. Purple / Pink-Leaning Berry Jam. My new favorite berry shade! This is one of those super rich crèmes that, in my opinion, matches the color of ripe raspberries to a T – it literally makes me want to go berry picking! The formula on this one is amazing – thick, yes; but easy to work with and completely opaque in two coats. This is a must-have summer-to-fall transition shade. Love it! 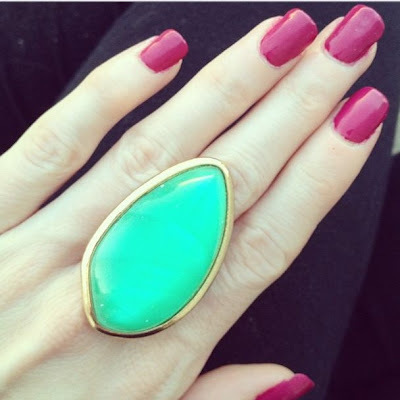 Accessories: Jagged Faux Stone Ring in Seafoam / Gold via Forever 21. Be a Roaring Twenties Flapper...mark Style! Since I first read F. Scott Fitzgerald’s The Great Gatsby more than a decade ago, I have adored flappers and the Roaring Twenties – an obsession that has recently been reignited via Anna Godbersen’s Bright Young Things trilogy. One of the things that has made the era stick out so strongly in my mind? The makeup, fashions, and accessories, of course – all of which, I have found, can be obtained (affordably!) via one of my favorite makeup and fashion brands in the world…mark! ♥FACE: Apply Got the Goods Multi-Benefit Foundation Lotion SPF 15 in a complementary shade all over the face to even out skin tone. ♥EYES: Sweep I-mark Wet/Dry Eye Shadow in shade puff along the brow bones and lids. Apply shade tiki from the lash line to the crease of the eye. Line the outer corner and bottom lash line with No Place to Run Longwear Eyeliner in shade foxy brown. Brush two coats of Lash Act Build and Define Mascara in shade blackest black onto lashes. ♥CHEEKS: Dust Just Blushing Powder Blush in shade dollhouse on apples of the cheeks and blend upward. ♥LIPS: Apply Make It Rich Lip Color Crayon in shade royale. Download the face chart here for more in-depth instructions! 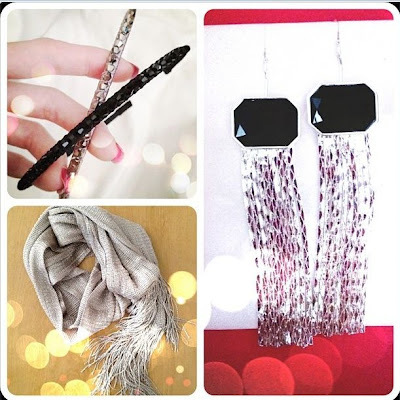 Now that you’ve Got the Roaring Twenties Flapper Look, let me introduce you to a few mark accessories that I was lucky enough to receive, which stay perfectly in tune with the flapper vibe (and make perfect sparkly additions to your accessory collection)! ♥mark Longing For It Earrings I’m more of a studs girl myself, but there are times when you went to feel big, dangly earrings sweeping your bare shoulders to make you feel ultra-glamorous, which is why I love these. The color is this super rich, bright silver (almost with a white undertone) that is incredibly eye-catching, and seriously make your eyes sparkle like crazy if you keep your hair pulled up in a wispy topknot. 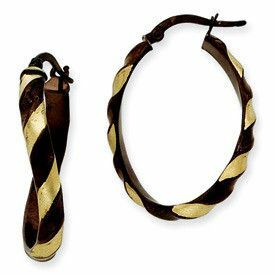 Like the mark Show Your Metal Necklace I reviewed last week, these are incredibly lightweight, so you don’t wind up with a headache after a few hours of wear. Super fun – especially for Date Nights or Girls Night Out! $20.00. ♥mark Add Sparkle Headbands I love, love flapper-esque headbands that wrap around your head, but they are basically ruled out for me because I have bangs; so I absolutely adore these Add Sparkle Headbands, because they have that dreamy Twenties Girl vibe without leaving your bangs a mess. These are a really sweet, glittery addition to simple ponies; and give you that Louis Vuitton Spring / Summer 2012 girly vibe if you slip them on with a high ballerina bun. I like to wear both colors together for extra sparkle. $14.00 for two. ♥mark Nice Accent Scarf This is probably one of the most versatile accessories I have every owned. The shade is similar to a light milk chocolate and interwoven with gold pieces to make it shimmer (which is what makes it seem very glamorous and flapper-ish to me); and the rayon construction makes it incredibly lightweight, so that you can kind of toss it on with anything in your closet – I paired it with black skinny jeans, a black tank top, and my mark High Drama Pumps (reviewed here) for a friend’s birthday not too long ago, and it looked amazing. It’s a really fun piece to have if you want to add a subtle shimmer to your outfit!$16.00. What do you think of this mark makeup look? Will you be picking up any of these flapper-ific accessories? Follow me on Instagram @cafefashionista to check out my latest accessory additions. Thanks to mark for the picture. 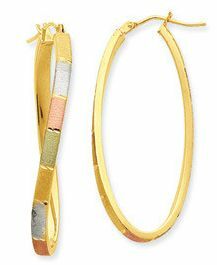 FTC Disclosure: The Longing For It Earrings, Add Sparkle Headbands, and Nice Accent Scarf were sent to me for review; however, all opinions expressed therein are my own. As many of you could probably tell from my 365 Style Guide: Fox Trot post last week, as well as my frequent mentions of Roald Dahl’s The Fantastic Mr. Fox, I have a teeny tiny (read: massive) obsession with foxes – especially once the fall season rolls around; thus the reason I was so thrilled to receive this Fox Face Pendant Necklace from AliExpress by Alibaba. This is, without question, my new favorite accessory for fall. The diamante embellishment adds a beautiful sparkle to the fox motif; and the little tuft of white faux fur on the fox’s tummy makes it feel so cozy and authentic. The pendant falls, on me, right at mid-stomach (below my chest), so it rests perfectly upon sweaters, and is the perfect, perfect whimsical touch to any outfit. I am positively smitten with this necklace (as is everyone who has seen it on me, it seems)! 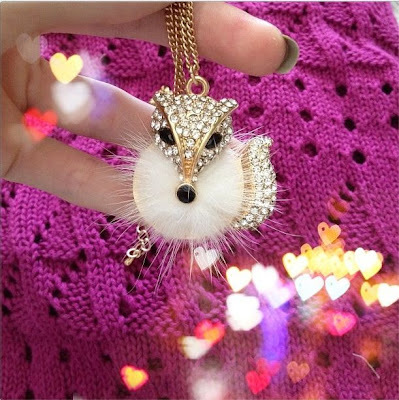 Irresistibly cute, and the ultimate conversation starter - no can resist a fancy fox! Stay tuned for the chance to take your own fox accessory home from AliExpress by Alibaba right here on Café Fashionista – Giveaway to come soon! FTC Disclosure: This item was sent to me for review; however, all opinions expressed therein are my own. For a Good Time, Call...Film Giveaway!